I can't believe it's been eight weeks since I last updated you! It's a testament to how crazy and fast the first two months of the semester is. So much has happened in these weeks, but I'll do my best to tell you a few cool stories that typify the kind of widespread, powerful work God is doing on our campuses. This picture is from our second Thursday Night Focus. 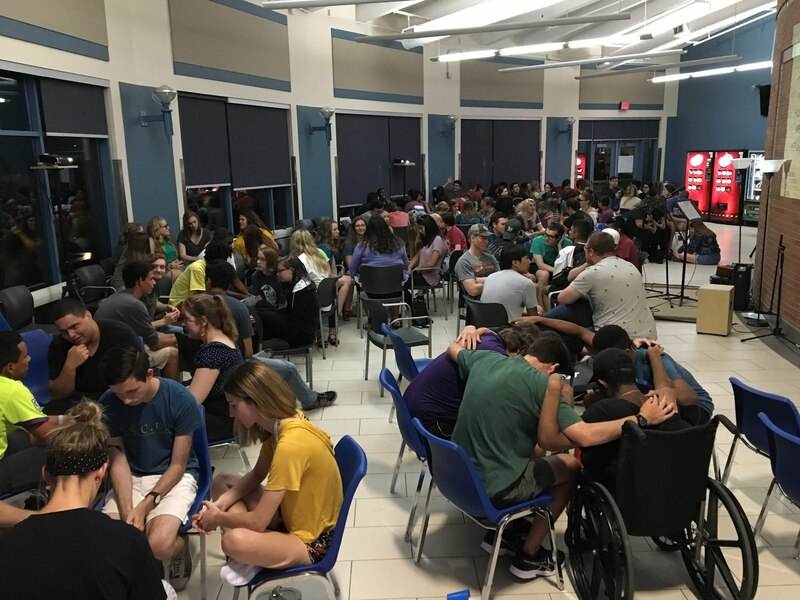 We've been regularly having around 160 students show up each week, ready to worship, hear the word of God preached, and fellowship with one another. It's been so neat to see friendships blossom and a love for God develop among these students. And that's just at Thursday Night! Our small groups have started, around 12 of them in all at all the three Collin campuses. Those have numerous students involved that don't attend TNF and that are developing friendships and community in a more intimate setting. Our one-on-one studies of the Bible have also been going and that's been a bit slower than most years, but our student leaders are really looking for opportunities to meet and befriend new folks. A huge deal that happened 3 weekends ago was our Fall Camp. We had about 130 students show up to Camp Lebanon for the weekend and it was a blast. 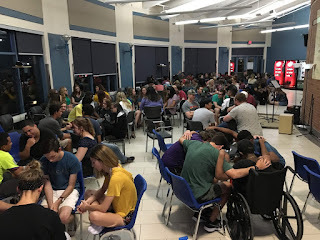 I think the highlight for most students was the worship night we did where we sang together and had different worshipful activities that they could do on their own throughout the night. Fall Camp was huge for us because it helps our students build so much momentum in their relationships with God and one another. We talked about community and God's plan to use it to reach the world and bring his kingdom. On another note, our outreach has been really successful so far this semester as well. We've been meeting a ton of new people who are getting involved in Focus and pursuing a relationship with Jesus. Our students have been really faithful to showing up and meeting people, something that's outside of most of their comfort zones. It's been neat to see them get over their fears to do that. As usual, we face numerous difficulties/opportunities as well that we would appreciate you praying for. We've noticed a growing number of students who are depressed, suicidal, anxious, identity-confused, and mentally unhealthy. We know Jesus is the answer, but it can be hard knowing how to apply that reality in all situations and we need wisdom and grace to be able to do that. An opportunity have is from the school who, annually, decides whether to give Collin Focus money to help send our students to Winter Camp. That's a big deal and we could use your prayer there as well. Thank you so much for your continued love and support, especially your prayers. We are praying for you as well.